Getting the news that you didn’t get the sublease in corporate optometry can be discourage. It can be frustrating to want to start your own business and not getting the opportunity that you need to jump start your career. Don’t let these small road blocks inhibit your goal to becoming self employed. Unfortunately, there are many reason why you didn’t get the sublease, some you don’t even realize. To get different results try a non traditional approach to a corporate optometry sublease. Here are Five Unspoken reasons why you didn’t get the sublease and what you can do to ensure a different result the next time. You’re new to the sublease world. It’s a strategic game in its self. If you have no experience it will be more difficult to be able to become the lease holder. Your confidence in your business skills will say a lot about your motivation to drive the business and if the corporate optical thinks you are there to stay and build a career from it. Action Plan: Spend a few days with an OD and see how their office operates. Get comfortable with the optical staff ask questions and get hands on experience. Consider working part time at another office as an independent. You will gain experience and have already started setting up your business so when you have the next sublease opportunity it will take less time to get credentialed and transferring locations. The decision has been already made. The interview with you is either a back up plan or a way to gather more information or data for the recruiter. Many times your interview is to determine if you are the candidate that will provide more contracted hours compared to others. Action Plan: Make them Sublease #2. Always be looking for the next opportunity. Network with people in the industry. 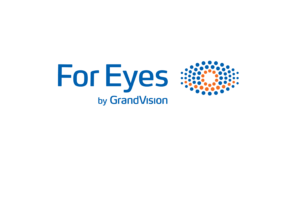 Learn the business metrics in corporate optometry and what reasonable coverage is for certain patient volume. Many great opportunities are via word of mouth and get filled before the position gets posted. Don’t act like you deserve it. Being confident in ok but you should prove that you are results driven to illustrate that you are the right candidate for that sublease. Sublease is a partnership that evolves over the years, if your mindset is inflated the business will suffer as non peak times reveal the strongest entrepreneurs . Action Plan: Understand that businesses need to evolve over time. This includes you as an optometrist to continue to expand your scope but also to clearly understand the optical side of the business. The success of the business will involve an active partnership with the optical and being able to receive constructive criticism and learn from it. There will be failures, how you adapt and pivot will create future success. 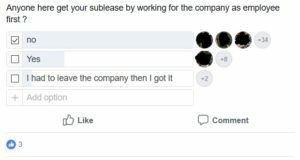 Survey taken in the Corporate Optometry Facebook group found that on average if an OD was employed by the company the chances of switching from employed to sublease within the company was less likely to obtain a sublease. The survey also illustrated that ODs that were employed at corporate opticals that had more difficulty recruiting would promote to sublease from within. Action Plan: Based on the survey if you are an employed OD at one corporate optical and you want a sublease at the same brand it is better that you seek sublease opportunities outside the company. Your chances of getting a sublease at a different brand will be higher because the corporate optical does not have to fill that employed position when you switch to another position within the same company. Taking on a sublease is more involved than seeing patients. You will need to able to evaluate trends on the optical side of the business and how it can effect your business. The business will have cyclical changes, how you manage those changes will reflect on your success. There will be indirect conversations to evaluate how you as the business owner would adapt and set your business on a growth trajectory. Action Plan: Have a solution or proposal to the obstacles within corporation. Be confident in your recommendations during the interview. Anticipate the questions that will be asked. Have a company-owner mindset and don’t be afraid of thinking outside the box.